Our Engineering Doctorate (Eng.D) programme is aimed at developing individuals who are able to conduct research at doctoral level by tackling real-life industrial problems and implement innovative solutions in which significantly contribute to the business performance of their companies. Engineering Doctorate (Eng.D) is a mixed mode doctoral programme that embed the industrially-focused area into research with an aim of solving real-life-work-based problems. It combines research in engineering which incorporates training in business with management skills into developing innovative solutions to technological products or processes. The Eng.D programme consists of two components: taught-course modules and research project. The taught-course components covering topics to enhance candidates’ knowledge and skills in Engineering Business Management (EBM). While, the scope of research project on industry-focused applied-research project, guided by academic and industrial supervisors is aimed at solving real-life-work-based problems innovatively. 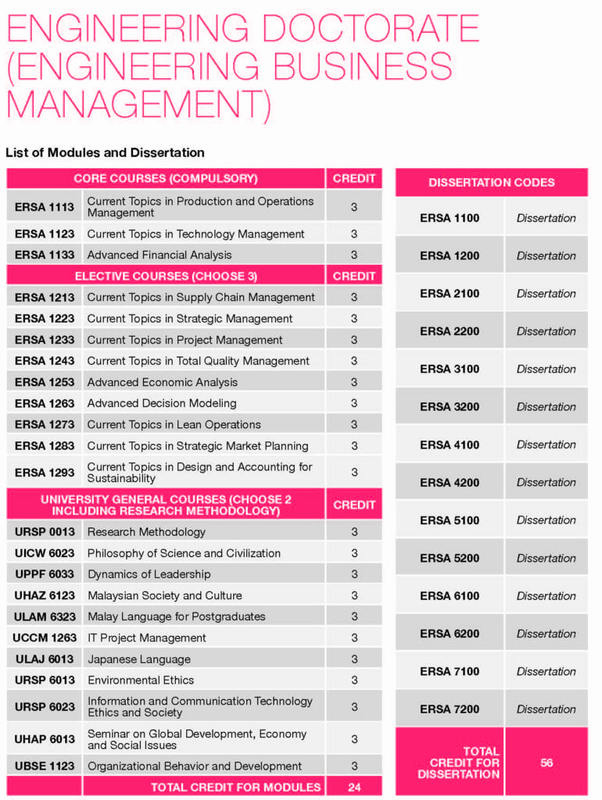 There are 8 modules that has to be completed by the candidate with a total of 24 credits. Candidates must achieve a minimum CPA of 3.00 for the taught course modules. While the research projects contribute of 56 credits. This makes a total of 80 credits for the completion of the study. At the end of the study, the candidate must submit a dissertation and undertake an oral examination (viva-voce). The minimum period of study for candidates is 3 years (6 semesters) and a maximum of 8 years (16 semesters). • Graduate able to acquire and apply indepth engineering business management knowledge that can give an impact to the industry and society of both national and international. • Graduate able to become competent researchers with their expertise in the management engineering field who take into account the latest knowledge and within the professional code practice and integrity. The Eng.D research project must be based on an industry. An agreement should be obtained from the top management of the industry or the cooperating company regarding their support and commitment to the Eng.D research project. 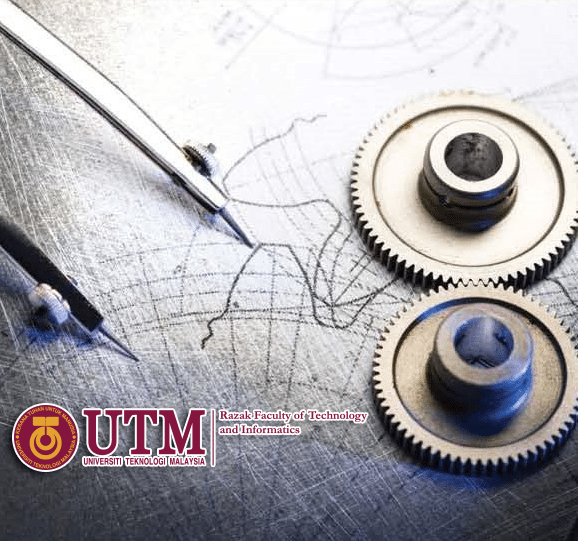 The candidate will be supervised by an Academic Supervisor who is a full-time graduate faculty of UTM and a co-supervisor who holds a senior management post in the industry. If necessary, more than one Academic Supervisor may be appointed for a candidate. Work opportunity ranges from project work in the private sector via product development management, construction and product design to interaction design and usability experts.